Anybody who tends to sit a lot will eventually experience problems and symptoms associated with prolonged sitting, like reduced spinal flexibility and fragile back muscles, resulting in bad posture and increased risk of spinal injury. Weak back muscles do not have the strength to properly carry your body while flexibility in your back is important for most daily activities and sports. Increasing the strength and flexibility of the muscles surrounding the spine is highly recommended during your 30s and should be one of the priorities after you reach 40. 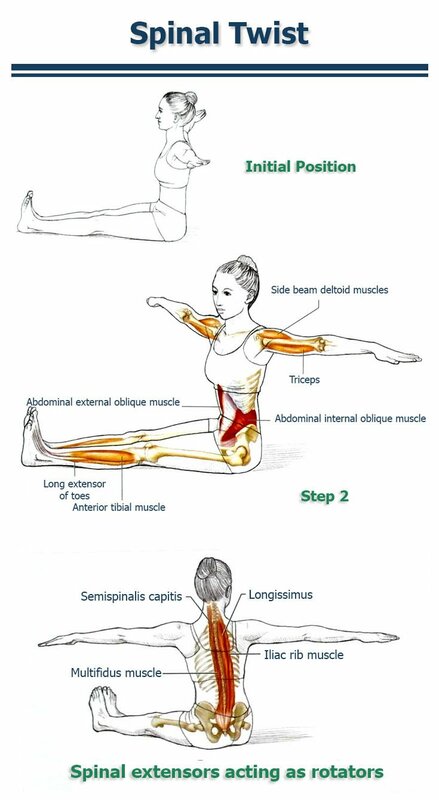 Today’s exercise focuses on the spinal rotator muscles. Mastering this simple movement will improve the strength and flexibility of your core and cut by half the risk of some of the most common injuries to the back. Furthermore, if you suffer from lower back pain after prolonged periods of sitting, you will notice improvements even after a couple of sessions. Today’s exercise, Spinal Twist, is a perfect partner to the Lateral Leg Lift we published previously and can be done during the same routine or interchanged with it on daily basis. This exercise is invaluable for learning to rotate the pelvis and lower back while maintaining an aligned core. The common error we unconsciously make when we rotate the spine is the excessive arching of the back so that the spinal extensors can drive the movement. 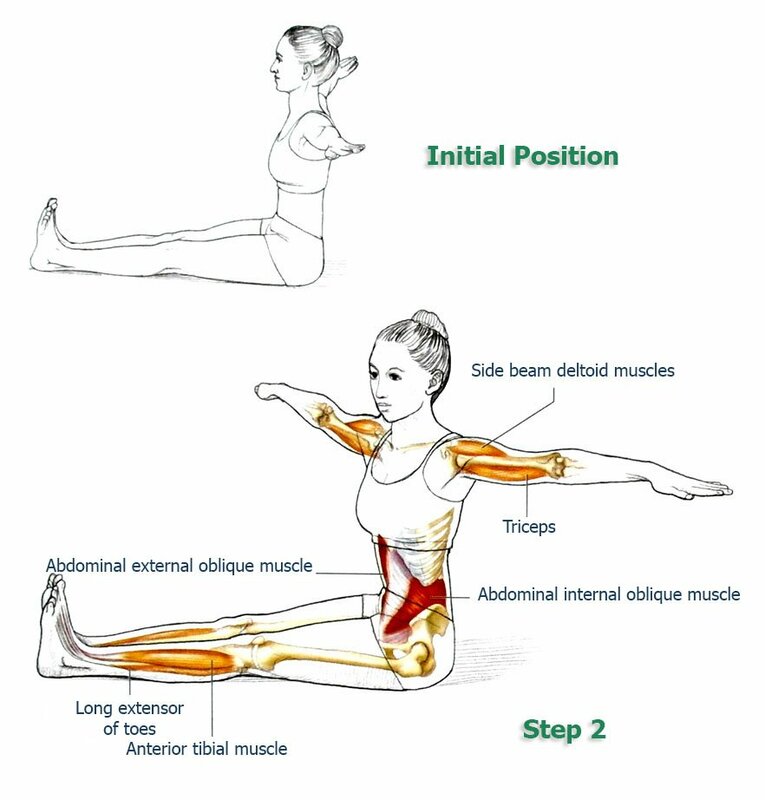 The proper way to rotate the spine would be by applying your abdominal muscles. Learning to use the transversus abdominis and obliques in the position we’ll demonstrate today will help protect the spine from injury when spinal rotation is used, particularly during challenging exercises and sports (or even sudden spinal twists common during car accidents, for example). Inhale: rotate the trunk back to center. Repeat the sequence 5 times on each side, 10 times in total. To perfect the movement, try imagining the spine spiraling up as it twists so that it feels as if your head is getting closer to the ceiling as you rotate. This exercise can also be done by lying down. However, the vertical position of the spine provides additional benefits as you are in a position that is used during your everyday activities and sports, such as golf or tennis. Also, keeping the body upright against gravity tasks the torso muscles in a slightly more challenging way. The key to this exercise is learning to use the core rather than the shoulders for rotation. This is fundamental for creating optimal athletic performance and preventing common injuries to the back. Notice that when you rotate to the right while in a sitting position, the left external and right internal obliques generally act as the prime movers. However, if they acted alone, they would also make your torso bend forward since they are spinal flexors as well as rotators. 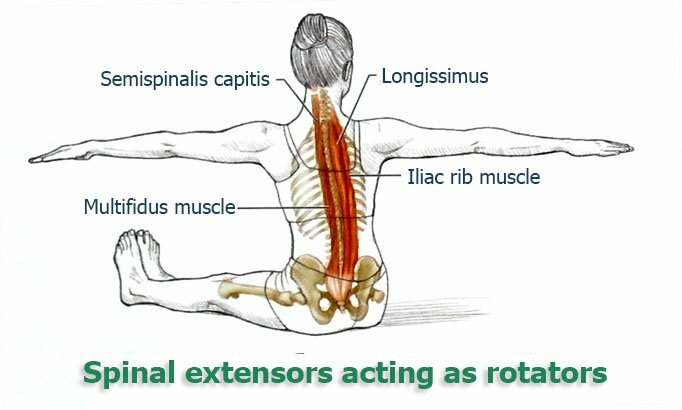 Appropriate activation of the spinal extensors is necessary to keep the spine vertical. As shown in the illustration above, these extensors, particularly the right longissimus, right iliocostalis, left semispinalis, and left multifidus, also assist with right rotation of the torso. Appropriate contraction of these and other muscles allows the spine to rotate without bending forward or arching backward. The combined work and coordination of all these muscles during the exercise benefits you with inherent skills, which, once developed, you’ll unconsciously use in all daily activities. Enjoy and don’t forget to share! Gym Injuries: Safe and Sound?